With the Patriots-Colts AFC Championship rematch on Sunday Night Football being one of the headlining games of the 2015 regular season, you just knew there would be some good old fashioned reliving of the DeflateGate drama that has dominated the sports world narratives this year. And no good NFL narrative is complete without its own prop bet. Bovada, of course, offered a DeflateGate-related prop bet last night – an Over/Under of 2.5 DeflateGate mentions from the live broadcast. However, I’m not sure Bovada ever counts on these game broadcast prop bets being engaged on the air by the announcers. 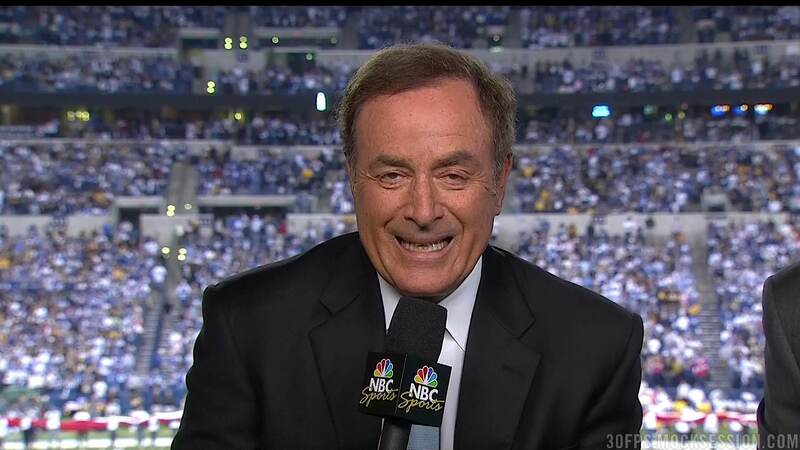 But God bless him, that’s why we love Al Michaels. The expert of the veiled gambling reference gave an early Christmas present to everyone who bet the over. The only thing that could make that better is imagining Brent Musburger celebrating a winning parlay combining the DeflateGate over with the Colts’ backdoor cover at his Montana ranch.